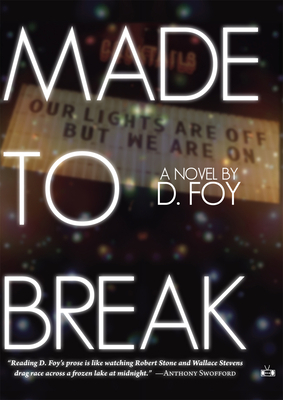 "Made to Break, D. Foy's debut novel, snaps. Literary, cinematic... Foy] is a writing school of one, and Made to Break ushers his literary energies into categorical existence." "Strange and freewheeling... forsaking plot in favor of something much more cerebral and immediate. Made to Break works its English over, coining fresh and sometimes unapologetically awkward phrases to milk out something strange and animate." " Made to Break] reads like a macabre mumblecore script penned by Jim Thompson. It's one swell medley of mayhem and defeat dashed together by the vitality of D. Foy's prose. Zainy, sly, and darkly comedic." "With influences that range from Jack Kerouac to Tom Waits and a prose that possesses a fast, strange, perennially changing rhythm that's somewhat akin to some of John Coltrane's wildest compositions, this narrative is at once emotionally gritty and surprisingly beautiful even during its darkest moments. Foy has delivered the kind of notable narrative that pulls an author out of the very crowded rookie pool and places him at the top of the list of fresh voices that readers of outstanding fiction should keep on their radar." Two days before New Years, a pack of five friends--three men and two women--head to a remote cabin near Lake Tahoe to celebrate the holidays. They've been buddies forever, banded together by scrapes and squalor, their relationships defined by these wild times. With some of the most luminous and purple prose flexed in recent memory, D. Foy is an incendiary new voice and Made to Break, a grand, episodic debut, redolent of the stark conscience of Denis Johnson and the spellbinding vision of Roberto Bola o.
D. Foy has had work published or forthcoming in BOMB, Post Road, the Literary Review, the Georgia Review, Forty Stories: New Writing from Harper Perennial, and Laundromat, an homage to photographs of laundromats throughout New York City (powerHouse Books).